People did not always live on the surface of the earth. At one time people and animals lived underneath the earth with Kaang (Käng), the Great Master and Lord of All Life. In this place people and animals lived together peacefully. They understood each other. No one ever wanted for anything and it was always light even though there wasn't any sun. During this time of bliss Kaang began to plan the wonders he would put in the world above. First Kaang created a wondrous tree, with branches stretching over the entire country. At the base of the tree he dug a hole that reached all the way down into the world where the people and animals lived. After he had finished furnishing the world as he pleased he led the first man up the hole. He sat down on the edge of the hole and soon the first woman came up out of it. Soon all the people were gathered at the foot of the tree, awed by the world they had just entered. Next, Kaang began helping the animals climb out of the hole. 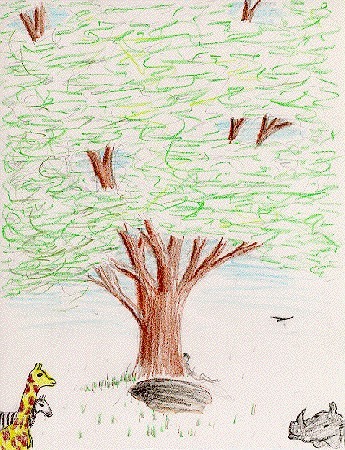 In their eagerness some of the animals found a way to climb up through the tree's roots and come out of the branches. They continued racing out of the world beneath until all of the animals were out. Kaang gathered all the people and animals about him. He instructed them to live together peacefully. Then he turned to the men and women and warned them not to build any fires or a great evil would befall them. They gave their word and Kaang left to where he could watch his world secretly. As evening approached the sun began to sink beneath the horizon. The people and animals stood watching this phenomenon, but when the sun disappeared fear entered the hearts of the people. They could no longer see each other as they lacked the eyes of the animals which were capable of seeing in the dark. They lacked the warm fur of the animals also and soon grew cold. In desperation one man suggested that they build a fire to keep warm. Forgetting Kaang's warning they disobeyed him. They soon grew warm and were once again able to see each other. However the fire frightened the animals. They fled to the caves and mountains and ever since the people broke Kaang's command people have not been able to communicate with animals. Now fear has replaced the seat friendship once held between the two groups. This may be part of the reason that animals play such an important role in their myth.